There has been quite a bit of talk over the last three years about the construction of oil pipelines in the United States most of the conversation have revolved around the Keystone XL pipeline and the Dakota Access Pipeline (DAPL). The proposed pipelines are unnecessarily duplicative. They will not make America more energy independent but merely increase oil companies’ profits while further endangering the environment. With the protest by local residents apparently defeated by the Trump administration, it would be helpful to take an in-depth look at the issue. The existing Keystone Pipeline begins in Alberta, Canada, and travels across Saskatchewan to Manitoba. There, it takes a sharp turn south across North and South Dakota to a juncture in Nebraska, where it splits, with a spur going to refineries in Illinois. This entire system covers about 2,150 miles. Another section of the pipeline continues south out of Nebraska, flowing to Kansas, Oklahoma and finally to Texas, covering about an additional 775 miles. The Canadian company TransCanada, which owns Keystone, has proposed a new addition to the pipeline – building down from the original starting point to the juncture in Nebraska. Although called XL, it may as well be known as Keystone Hypotenuse, since the proposed line would complete a right triangle. It would not significantly increase the flow of oil to refineries in Texas and Illinois, since the original end line pieces would remain in place. It would, however, greatly reduce the chance of a major oil spill in Canada while increasing the risk of a spill in the United States. 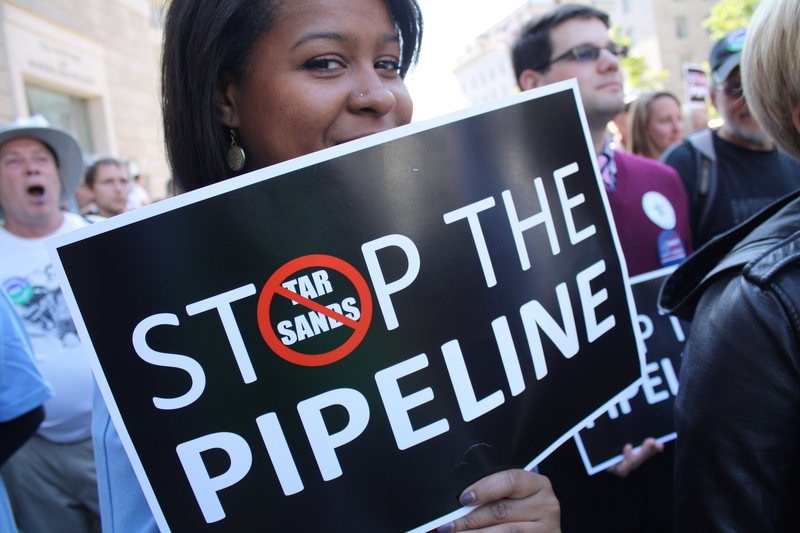 American environmentalists opposed the pipeline for exactly that reason. Scientific American summed up the debate over the pipeline this way: Keystone XL would have no major impact positively or negatively on the US economy; it would be the most efficient method of transporting Canadian tar sand oil to the American refineries; tar sand oil is roughly 17% higher in greenhouse gas emissions (the ones which lead to global warming) than conventional oil or natural gas. Because TransCanada is a foreign company, the United States Department of State had to make a recommendation to the president on whether construction of the pipeline should go forward. Back in 2008, under oilman George W. Bush, the State Department gave Keystone the green light and construction began. An additional report came from the State Department in 2013, which was challenged by the Environmental Protection Agency. Both these reports weighed heavily in Barack Obama’s decision to cancel the Keystone XL by executive order in November 2015. When he became president in January 2017, Donald Trump appointed longtime oilman and former CEO of ExxonMobile Rex Tillerson as Secretary of State, and Scott Pruitt as head of the EPA. Pruitt is perhaps best known for suing the EPA 13 times since 2011, attempting to limit the agency from regulating air and water polluters. With these two men now overseeing the agencies which had previously ruled against the pipeline, Trump felt comfortable signing an executive order which has allowed TransCanada to once again begin construction of Keystone XL. The second pipeline, DAPL, begins in northern North Dakota. Although the shale oil field it services is only a few hundred miles from an existing portion of the Keystone pipeline in Saskatchewan, the owners of the oil field would prefer to build a new, 1200 mile pipeline. The proposed route would have it go southeast towards the terminus of the current Keystone’s pipe in Illinois. Not only does DAPL start near Keystone and end in the same location Keystone ends, but DAPL would actually cross paths with Keystone in South Dakota, going directly beneath it (DAPL will be a buried pipeline). Trump’s executive order allows government law enforcement to evict Native Americans who have been protesting from the site and allows construction to begin anew. Why are these two pipelines so controversial? Mostly because transporting oil in pipelines is dangerous to the environment. Between 2010 and 2015, pipelines spilled over 7 million gallons of crude, including one single leak of 840,000 gallons in North Dakota in 2013, according to the Pipeline and Hazardous Material Safety Administration, part of the US Department of Transportation. In the last 20 years, there have been over 11,200 leaks, large and small, in America’s pipeline system. With less than 150 inspectors covering 2.5 million miles of pipeline, future spills are guaranteed. Many, if not most of these pipelines move along river and stream beds, as that is the easiest terrain to follow. An oil spill will immediately contaminate the local aquifer, making the drinking water completely non-potable. When that happens, you’ll know who to thank.